The making of moccasins and mukluks by Aboriginal people in Canada is an ancient tradition, a useful craft and a proud story passed down through generations. Today that tale has gone global, told by a Métis-owned company that is now competing with the world’s footwear giants. 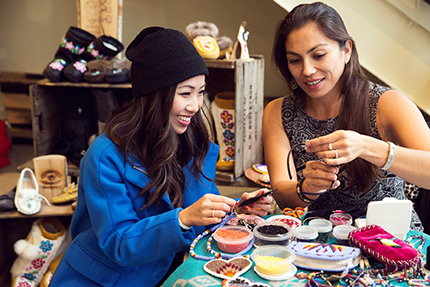 With sales in 45 countries, Manitobah Mukluks has found success through a compelling strategy that holds lessons for other companies selling Indigenous products and other unique goods and services abroad. Artisans from the Manitobah Mukluks Storyboot School teach the art of making mukluks to young Aboriginal students. “We need to be able to tell our story,” says Tara Barnes, director of brand development for the company, which is the world’s leading manufacturer of modern mukluks and moccasins. The narrative dates to the dawn of the North American fur trade in the 1600s and the birth of a new people in Canada, the Métis. Artisans from the Métis community created handmade clothing and footwear to sell to new markets. The tradition declined through the generations as such goods became popularized and mass-produced. That is until Sean McCormick, a Métis entrepreneur from Manitoba, opened a trading post in Winnipeg in 1993, trading tanned hides and furs for handmade moccasins created by Indigenous women in the area. McCormick’s ancestors had worked the trap lines around The Pas, in northern Manitoba. He launched his first company, Blue Moose Clothing Co., in 1997, selling items through gift shops and select retailers. A photo in a magazine of supermodel Kate Moss wearing a pair of the company’s mukluks in 2004 brought sudden recognition—what McCormick calls his “aha moment”—and the brand took off. With more celebrities sporting the footwear—its customers to date include Cindy Crawford, Megan Fox, Jessica Biel, Justin Timberlake, Shailene Woodley, Gwen Stefani, Prince Harry and Sophie Grégoire-Trudeau—the company brought in new investors and partners. 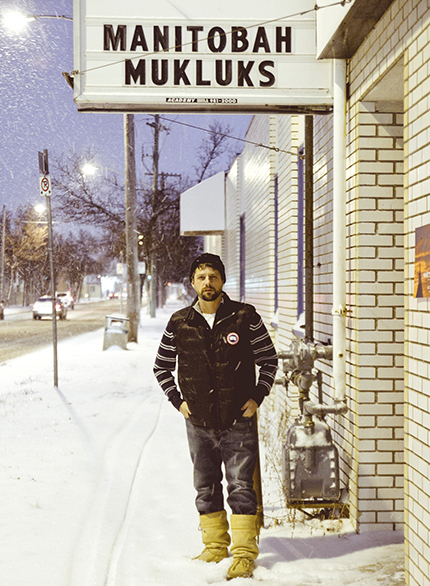 Sean McCormick stands in front of his store in Manitoba. In 2008 the company was recast as Manitobah Mukluks, focusing on the footwear market as opposed to giftware. There was a new marketing and distribution strategy, which included a tremendous amount of promotion through word-of-mouth and social media. The strategy includes an effective e-commerce platform for sales, through an online Shopify store where the company can tell its authentic story directly to consumers. McCormick’s ancestry and his goal to give back to the Indigenous artisans who helped him start the business plays a big role in the company’s approach, says Barnes. Manitobah Mukluks aims to raise awareness about sustainability and keeping Indigenous culture alive, she adds, with a vision to build a vibrant, global brand that makes an impact in Indigenous communities. A key part of the communications effort is telling consumers that the mukluks are warm, comfortable and functional footwear dating back centuries, albeit with a rubber sole that makes them more practical, Barnes says. Marketing dollars go almost entirely into online advertising, for example through Google Ad Words, Facebook, Instagram and search engine optimization, which allows the company to instantly track results in terms of sales. McCormick says the company has developed its overseas market with support from the Canadian Trade Commissioner Service (TCS), Export Development Canada and the Business Development Bank of Canada. “The trade commissioners abroad have helped us find international distributors interested in our Canadian Indigenous brand,” he explains. Some of the footwear is sold internationally through major chains and independent retailers—mainly in the United States—but also as far away as Norway and Korea. It also has distributors in Russia and Norway. Today about 80 percent of the company’s production takes place in ethical factories overseas, mostly in Vietnam, which it owns and supplies, helping it to scale the business. The rest are made in Winnipeg. One important element of that story is the Manitobah Mukluks Storyboot Project, which began in 2010 to help Métis artisans preserve the art of making traditional moccasins and mukluks. They teach the art-form to young Aboriginal students across the country in the Storyboot School, and storyboots made by the artisans are sold at premium prices online. The company sells about 100 pairs of these one-of-a-kind Manitobah Storyboots a year. Manitobah Mukluks gives back to the community by training Aboriginal people in commerce and business skills. Today, half of the company’s employees in Canada are Aboriginal, and McCormick mentors Aboriginal youth to become successful entrepreneurs. The company is working on new products, for example it has developed its first waterproof boots, which sold out quickly over the fall and winter season, Barnes says. Manitobah Mukluks is currently the fastest-growing footwear brand in Canada and competes with the likes of Ugg and Sorel Boots, with e-commerce customers as far away as Norway and Japan. Barnes says the success of Aboriginal products such as the mukluks in foreign markets is in part due to the fact that they stem from traditions kept alive through thousands of years. Indigenous arts and crafts, she adds, have a wide appeal and spark interest in their cultural roots.